Objective: Extrapyramidal adverse effects of antipsychotic drugs are more reported in children. Biperiden is an anticholinergic agent to treat the adverse effects of antipsychotic drugs. The drug has the potential to induce delirium at toxic doses. However, data are scarce about delirium associated with biperiden in children. Thus far, a case of delirium has been associated with biperiden in an adolescent patient. We report the first case of delirium associated with the use of biperiden in a preadolescent patient. Case Report: A boy aged five years and weighing 20 kilograms had been diagnosed as having oppositional defiant disorder and separation anxiety disorder in the previous treatment center. Ten milligrams fluoxetine and 0.25 milligrams risperidone had been initiated. On the third day of treatment, dystonia developed and he was administered with biperiden. An hour later, he was brought to our emergency clinic due to disorganized speech and behavior. His vital signs were stable. There were no findings in blood and urine tests. No electrolyte imbalance, liver, kidney, and thyroid dysfunction have been observed. His neurologic examination was unremarkable and no abnormal findings were shown on cranial magnetic resonance imaging. No other system findings or findings pointing out to infectious diseases have been observed. 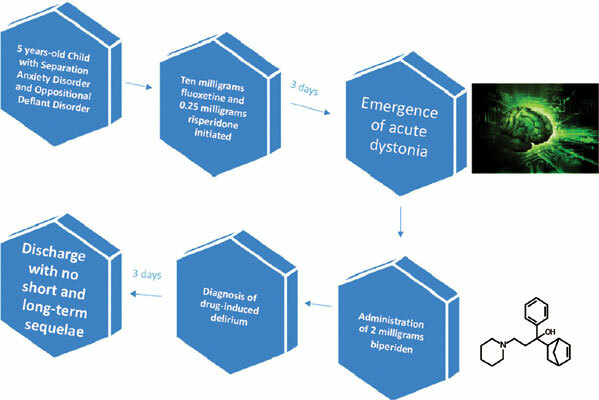 One milligram physostigmine was administered with intravenous infusion. However, symptoms did not resolve and he was diagnosed with delirium. Naranjo Adverse Drug Reaction Probability Scale score was seven, indicating a “Probable” Adverse Drug Reaction. Half milligram haloperidol was administered bid for three days and he was discharged with complete recovery. Conclusion: Clinicians must be aware of the risk of delirium when using non-toxic doses of biperiden in young children. Adverse effects, anticholinergic drugs, antipsychotics, delirium, psychiatry, psychopharmacology.